Until my recent retirement from Loughborough University, I had been running the Loughborough Sleep Research Centre (LSRC), well known nationally and internationally for its innovative work on sleep. For fifteen years I was the Editor of the Journal of Sleep Research (Wiley) – the main publication of the European Sleep Research Society. I remain as (emeritus) Professor at Loughborough U and am also an honorary Professor at Leicester University, in the Department of Neuroscience, Psychology and Behaviour, where I’m involved with various cross-disciplinary neuroscience initiatives. I am a Fellow of the Royal Society of Medicine and am Honorary Secretary of its Sleep Medicine section. With my other professional commitments for non-commercial organisations, and in continuing to give talks and lectures on sleep throughout the UK and abroad, I remain very active in exploring the intrigues of sleep, wherein mind and brain interact with body functions in both health and disease, in yet to be fully understood ways. Why we sleep – its functions – effects of sleep loss on body and brain – especially the ‘prefrontal cortex’ – the brain area mostly dealing with high level (‘executive’) thinking and decision making. The ageing brain – sleep as in index of changing (and improving) cognitive function. Is REM (‘dreaming’) sleep more a type of ‘non-wakefulness’ rather than being ‘real sleep’ ? Different types of ‘sleepiness’ – depends how you measure it – ‘tiredness’ is not the same as sleepiness. The debatable role of sleep in obesity, metabolism, metabolic disorders and cardiovascular disease. How much sleep do we really need ? – there are (largely unwarranted) concerns about ‘sleep debt’ and that today’s adult society is chronically sleep deprived. ‘Falling asleep at the wheel’, and the investigation of sleep related fatal road collisions. My work and sometimes controversial views on these areas have been published extensively in scientific and medical literature. These papers are listed by date at PubMed. These publications can also be seen on Google Scholar, and listed by number of citations. 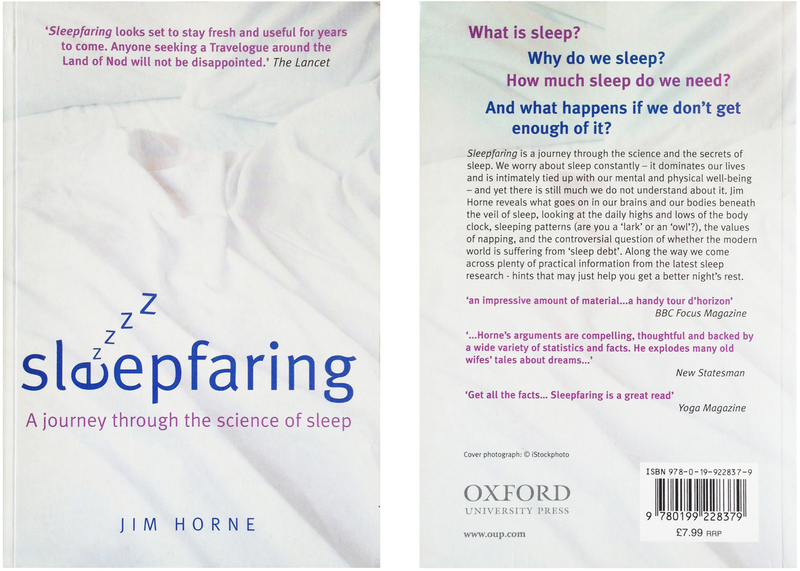 I have a more popular paperback on sleep: ‘Sleepfaring – a journey through the science of sleep’ Oxford University Press. various aspects of sleep, click each title to read.